Halloween sound effects can set the scene for a great Halloween party or serve as a spooky backdrop when trick-or-treaters come to the door. These sound effects are easy to find in various formats, from free downloads to purchased CDs. Halloween is the time of year when ghosts and goblins come out to play. These sound effects are a great backup for ghostly gatherings and haunted houses. Sobbing woman: A woman crying, sounding afraid. Ghost child's voice: Free effect featuring a spooky child calling for mama. Clock: A clock striking midnight. Ghostly phrases: Multiple free recordings of creepy voices including wails, cries, and common ghost phrases such as "Get out!" Haunted house: Free compilation of haunted house noises. Ghosts: Free track with multiple ghost voices. Footsteps: Sound effect of ghostly footsteps for under a dollar. Doors: The sound of a door creaking that costs less than two dollars. Ghostly chains: Thunder claps and ghostly chain sounds for about a dollar. Goblin voices: Different creepy vocals for just under $1. One hour of haunted effects: A downloadable MP3 that costs less than a dollar but features an hour of wails, moans, laughter, thumps, and other sounds associated with a haunted house. All kinds of spooky creatures come out on Halloween. Use these sound effects of monsters, witches, and werewolves, among others. Moaning mummy: Free track of a mummy moaning. Monster/Zombie growl: Short growling sound. Zombie group: Two minutes of moaning zombies for free download. Demons: This free effect features demon girls singing a lullaby. Monster versus dinosaur: Free download of what it would sound like if a monster ate a dinosaur. Bats: Paid recording of bat vocalizations that costs around $3. Werewolf: Collection of paid werewolf sound effects that cost around $3 each. Zombies: Two zombies star in this soundtrack that costs less than a dollar (or you can download the entire album of 80 zombie sound effects for less than $10). Witch cackles: Collection of MP3s featuring witch cackles that cost about a dollar each. Skeleton: Rattling bones for less than a dollar. Halloween has other spooky sounds, from alien crafts to thunderstorms. Alien ship: Free track of a rocket that could be used as a UFO effect. Pulse: A dark, pulsing sound. Halloween vocals: Free track featuring a group of spooky voices saying scary things. Storm: An assortment of rain and thunder sounds. Droning: A pulsing, droning sound. You need to purchase credits for sounds on this site for around $2 per sound. Halloween Spooky Sound Box: This app, available for Apple devices through the iTunes store, features a collection of over 96 effects for $1.99. Scary Sound Effects: A free album, subtitled Nightmarish Noise for Halloween, with 39 minutes of spooky effects. 53 Scary Sound Effects and Music: This CD by Hollywood Studio Sound Effects contains a nice variety of sounds for about $13. Once you've gathered a collection of sound effects for Halloween, you can put them to good use in a variety of ways! Make sure that all of your sounds are in the same format, and then put them together in a play list or on a CD so that you can take your sound effects with you. Haunted Houses - Haunted houses are a staple of Halloween celebrations. Use scary sounds to set the right atmosphere. Consider playing certain eerie sounds at key stops in the haunted house, suddenly and loudly, for maximum impact. Background music on Halloween night - When trick-or-treaters come to your door, treat them to some Halloween sounds. Save the really scary ones for later in the evening, when the very small children have already finished going door-to-door. 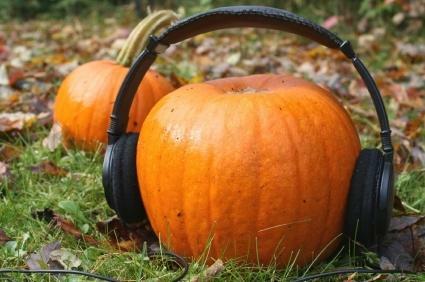 At a Halloween party - Halloween sounds make the perfect "filler" between Halloween-themed songs at a party. Intersperse your sound effects among the songs you've chosen to play to make sure that the theme of the party is carried out throughout the evening. On your answering service - If you're not taking serious business calls, use your Halloween sounds as part of your message on your telephone or cell phone answering service. If you're able to upload your own ring tones, that's another great use for your sound effects. As background music for a slideshow, video, or photo presentation - You could use these sound effects to create a fun video of your family's Halloween night, or put together a slideshow of photos that incorporates background sounds. No matter what you use the sound effects for, Halloween clips can be lots of fun to download or purchase, and play. Challenge yourself to find different ways to use these sounds to make your Halloween even eerier!